Home > Used Vehicles > 2012 Subaru Outback TOURING,AWD,SUNROOF,ALUMINUM WHEELS,AIR,TILT,CRUISE,PW,PL,LOCAL TRADE!!!!! 2012 Subaru Outback TOURING,AWD,SUNROOF,ALUMINUM WHEELS,AIR,TILT,CRUISE,PW,PL,LOCAL TRADE!!!!! 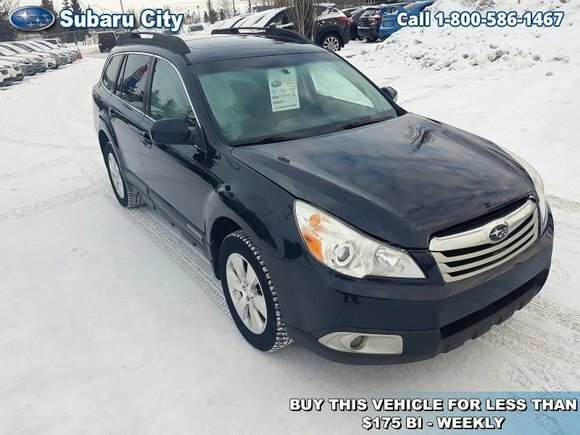 This 2012 Subaru Outback is for sale today in Edmonton. This Subaru Outback helps you seize every free moment with drop-everything-and-go versatility, plus durability you can count on. With standard Subaru Symmetrical All-Wheel Drive, you’ll always be geared up and in control. When you want to spend more time adventuring and less time preparing, there’s no other choice. With this Outback, versatility comes standard. This wagon has 120070 kms. It's deep indigo pearl in colour. It has an automatic transmission and is powered by a 3.6L H6 24V MPFI DOHC engine. Want to try the 2012 Subaru Outback TOURING?